So many of us dream of sleeping under a starlit sky. However, the thought of a cold, damp uncomfortable night pestered by insects can be rather off putting. Not when you sleep in a bubble! 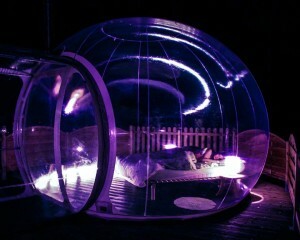 With the bubble for sleeping in, you spend your unusual night cocooned in a warm sphere. Your bubble is an observation point from which to appreciate the stars. So many well known constellations can be seen in France, but sometimes they are not always visible. Light pollution from the towns can prevent us seeing the display of constellations. But you can be assured that in your bubble this will not be a problem. You can discover (or recall) the mythical names of the constellations that pepper our skies. The Great Bear, Cassiopeia and Orion are the most visible in the northern hemisphere. From their position, one can identify the less well known. In total there are no less than 52 constellations visible throughout the year. Whether you are in search of a particular star or just wish to enjoy the magic of the stars in our galaxy a night in a bubble will enchant you. Forget spending a night in discomfort, outside, and experience the true benefits of a night in a bubble to appreciate the starlit sky. Far from the towns, you can enjoy the stars with all the comfort of a night in a hotel. Amateur astrologists or those seeking a grand spectacle may be interested in shooting stars, commencing in August. What better way of watching the magic, cosy in your bubble!.